Dhaka, 16 May, Abnews: Prime Minister Sheikh Hasina today urged the police force to provide proper service to people according to their expectation. "We want to see that our people get proper service from police and for this we are determined to make a smart, professional and public-friendly police force," she said. The prime minister was addressing the passing-out parade of the 35th BCS batch of assistant superintendents of police (ASPs) at the Bangladesh Police Academy at Sarda here today. The premier said the present government wants to ensure rule of law and justice to make the country's progress sustainable. Role of police in this regard is very crucial; she said, adding that the government is making constant efforts to build a technologically efficient police force to meet the expectation. She asked the new police officers for giving topmost priority to fundamental rights of the people, human rights and establishing rule of law while discharging their professional duties. "People always seek help from police when they are in troubles. You have to always keep this in mind. You have to acquire their confidence through your humane behaviour," she said. Home Minister Asaduzzaman Khan Kamal, Inspector General of Police (IGP) Jabed Patwari and principal of the academy Mohammad Najibur Rahman, among others, were present. Cabinet members, PM's advisors, parliament members, political leaders, and high civil and military officials were also present on the occasion. Sheikh Hasina took salute, reviewed the parade by riding on an open jeep and distributed awards among the best probationary officers. A total of 123 ASPs, including 18 female ones, passed the course. Among them, Mahbul Hasan received the award of "Best Probationer", Asma Akhter Sonia secured the "Best Academic Award" and Md. Salman Persi got the award of "Best Horsemanship". Probationer ASP Saiful Islan Rana was the parade commander. The prime minister said every step of her government is aimed to upholding the country's independence and sovereignty to move the country forward. She hoped that newly recruited police officers would play pioneering role in implementing 'Vision-2021' and 'Vision-2041' through sincere and honest services and proper application of knowledge and experience they have gained from the training in the academy. 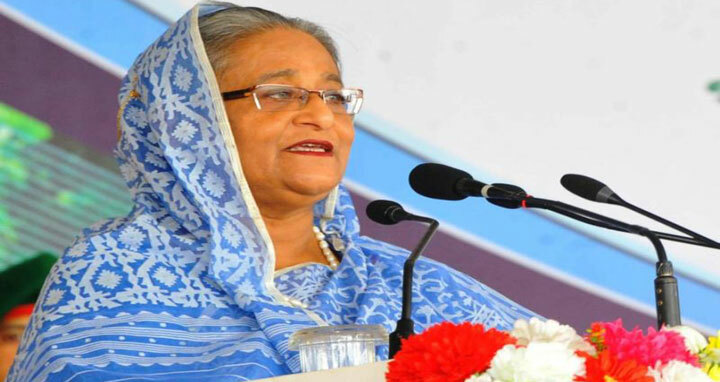 Mentioning various steps taken by her government for the development of Bangladesh Police force, the prime minister said some 46,000 posts were already created against the government announcement of creating 50,000 posts. Sheikh Hasina said the works for creating new units are going on to enhance the capacity of the police force. Police ranges in Rangpur and Mymensingh have already been raised up for formation of Rangpur RRF, Women Armed Police Battalion, 12 Armed Police Battalion, new police stations, investigation centers and police posts. Metropolitan police in Gazipur and Rangpur and Industrial Police were formed while anti-terrorism unit was created to combat militancy and terrorism. Specialized police units such as Police Bureau of Investigation (PIB), tourist police, police of riverine areas and two special security and protection battalions were also created. Emergency Service '999' has been introduced to BD Police Helpline and Online Police Clearance system. Pointing out the steps taken by her government for development of the Sarda police academy, the prime minister said the government would do more for infrastructural and academic development of the academy to build it as a centre of excellence. Sheikh Hasina said her government is actively considering modernizing all police training centres in the country to keep pace with the world. As victorious nation, we will live in the world community keeping our head high," she said. The prime minister said police will have to be more sensitive and proactive to women, children and old aged people and play a pioneering role in building a people friendly police force. Sheikh Hasina said "we want to build Bangladesh as a peaceful country in South Asia in where there would be no place for militancy, terrorism and drug dealers." "We have to create such a peaceful atmosphere where entrepreneurs at home and abroad would feel comfort to invest in Bangladesh," she added. The premier expressed her firm belief that the new police officers would be engaged in ensuring overall welfare of the country with their acquired knowledge, discipline, professionalism, honesty, and integrity. Appreciating the role of police in combating terrorism, the prime minister said police will have to deal with drug more efficiently as it has posed a threat to whole society and destroying families. Special drives should be taken against drug users, producers, suppliers and traders, she said, hoping that police must have to show their capacity to make the society free from drugs as they showed their competence in rooting out militancy and terrorism.